Complexity in the solid state can emerge structurally or chemically. Complex structures are characterized by the nature of their long-range and short-range order. Examples range from crystals with large unit cells to structures with incommensurately modulated periodicity (or quasi-periodicity) to structurally amorphous solids. Chemical complexity, on the other hand, arises simply by increasing the compositional variables; even simple structures, e.g., bcc or fcc, become challenging to characterize when multi-component systems are explored. Complex inter-metallics feature diverse bonding, stunning structural variations, and an exceptional breadth of physical properties. They also have widespread application for the construc-tion of materials, catalysts, magnets, high performance alloys for energy storage and conversion, as well as for other highly specialized applications. Their use is determined by their physical and chemical properties, which find their origin in the electronic structure. 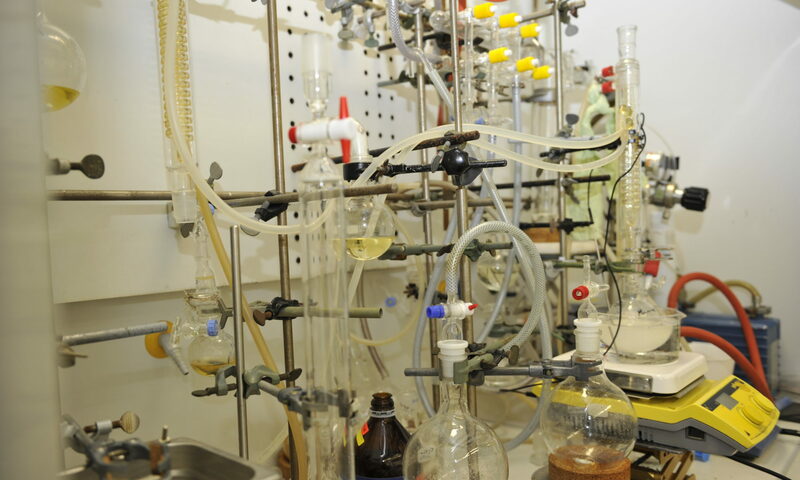 Our primary goal is to discover new, metal-rich materials while formulating (via electronic structure theory) structure-composition-property relationships for these materials in the bulk. As novel structures and bonding features emerge, further relationships between atomic and electronic structures will likewise emerge to guide further experimentation. M. Rhodehouse, T. Bell, V. Smetana, A.-V. Mudring, G.H. Meyer, An Obscured or Nonexistent Binary Intermetallic, Co7Pr17, its Existent Neighbor Co2Pr5, and Two New Ternaries in the System Co/Sn/Pr, CoSn3Pr1-x and Co2–xSn7Pr3, Cryst. Growth Des. 2018, 18, 6273-6283. DOI: 10.1021/acs.cgd.8b01141. T. Bell, C. Celania, V. Smetana, A.-V. Mudring, G.H. Meyer, Tb3Pd2, Er3Pd2 and Er6Co5–x: Structural Variations and Bonding in Rare Earth Richer Binary Intermetallics, Acta Cryst. C, 2018, C74, 991-996. DOI: https://doi.org/10.1107/S2053229618010549. M. Rhodehouse, T. Bell, V. Smetana A.-V. Mudring, G.H. 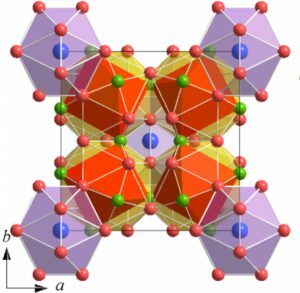 Meyer, From the non-existent polar intermetallic Pt3Pr4 via Pt2-xPr3 to novel Pt/Sn/Pr ternaries, Inorg. Chem, 2018, 57, 9949-9961. DOI: 10.1021/acs.inorgchem.8b01121. C. Celania,V. Smetana,A. Provino,P. Manfrinetti, A.-V. Mudring, R14(Au, M)51 (R = Y, La-Nd, Sm-Tb, Ho, Er, Yb, Lu; M = Al, Ga, Ge, In, Sn, Sb, Bi): Stability Ranges and Site Preference in the Gd14Ag51 Structure Type, Cryst. Growth Des. 2018, 18, 993-1001. DOI: 10.1021/acs.cgd.7b01469. C. Celania,V. Smetana,A.-V. Mudring, Bringing Order to Large Scale Disordered Complex Metal Alloys: Gd2Au15-xSbx and BaAuxGa12-x, CrystEngComm 2018, 20, 348-355 DOI: 10.1039/C7CE01865G. C. Celania, V. Smetana, A.-V. Mudring, Crystal Structures and new perspectives on Y3Au4 and Y15Au51, Acta Cryst. C 2017, C73, 692-696, DOI: 10.1107/S2053229617011068. C. Celania, V. Smetana, A. Provino, P. Manfrinetti, V. Pecharsky, A.-V. Mudring, R3Au9Pn (R = Y, Gd-TM; Pn = Sb, Bi): A Link between Cu10Sn3 and Gd14Ag51, Inorg. Chem. 2017, 56, 7247-7256, DOI: 10.1021/acs.inorgchem.7b00898. V. Smetana, S. Steinberg, Y. Mudryk, V. Pecharsky, G.J. Miller, A.-V. Mudring, Cation-Poor Complex Metallic Alloys in Ba(Eu)-Au-Al(Ga) Systems: identifying the Keys that Control Structural Arrangements and Atom Distribution at the Atomic Level, Inorg. Chem. 2015, 54, 10296-10308. DOI: 10.1021/acs.inorgchem.5b01633.